Are you a golf fan who likes to travel to new destinations? Do you plan your holidays around playing golf? If you answered yes to these questions, this post is for you. Don’t worry, there’s plenty of time to hack it up yourself on either side of the tournament. I volunteered at the Turkish Airlines Open (TAO) from November 2 – 5, 2017. For my first golf volunteering experience, it was awesome. 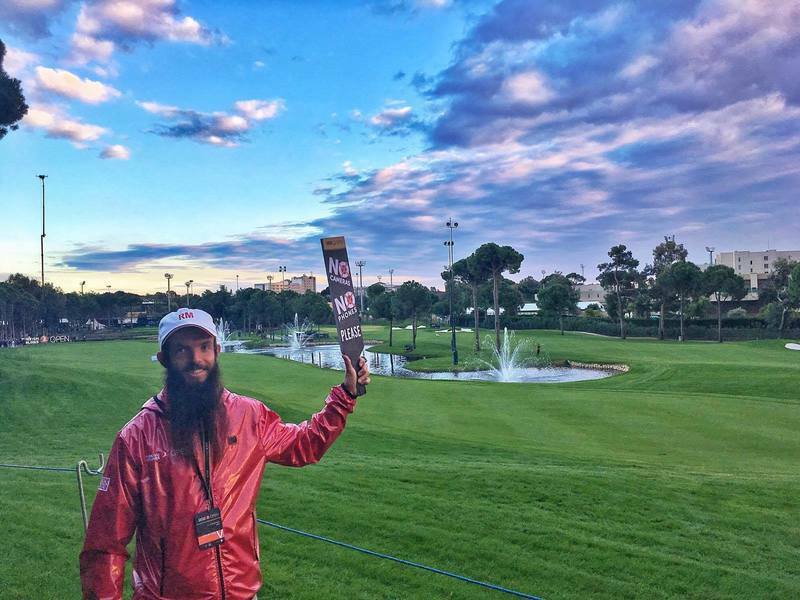 How did I ended up volunteering at the Turkish Airlines Open? I was looking at the European Tour Schedule on October 20th. A few clicks later I was on the Golf Volunteers Turkey website. 20 minutes later, I’d sent an application to be a course marshall at the tournament. Less than 24 hours later, I received an email from the volunteer bossman, Peter accepting my application (silly Peter). Thanks to the joys of flexible travel plans, I found myself on a mission to Antalya. I eventually made it to Antalya and had a great time volunteering at the TAO. By crikey waking up before 8 am was tough! The following are eight reasons why you should volunteer at a golf tournament on your next trip. Ruck & Maul were awesome enough to supply hats, polos, and jackets for all volunteers. I don’t exactly wear polos and/or jackets but am keeping them as souvenirs. As a bonus I now have a running a hat. Yay. Then you also have your volunteers accreditation on the lanyard. Who needs tacky, overpriced travel souvenirs when you can get freebies that tell a story! The role of a golf volunteer is to appear as invisible as possible to the players & spectators (not easy in our bright red tops). The less a player has to interact with you, the better. They need to focus on their game. So while I wasn’t feeling loved by the players as I ran around locating stray balls, volunteering isn’t about you (life is tough). Some of the things I saw spectators doing was insane (ps. your whispers while they play a shot are audible), even with marshalls present. One guy even picked up a players ball when both myself and the player were metres away. I can’t imagine the chaos spectators would cause if there were no marshals. The appreciation isn’t always seen, but the small thank yous from the players were nice. The walking scorers were always smiling with any balls given to them by the caddy at the end of the round. At this tournament, most of the volunteers were Brits. With Justin Rose winning, his visit to have a beer with the volunteers post-victory went down an absolute treat. “Where the pros play.” That is a quote somewhere I’m sure. This was so satisfying. Being able to duck under the ropes and not feel ‘naughty’ at all (only when I was working). I was walking across the fairways post tee shots (I was ball spotting on the 4th and 12th holes most of the weekend), and when I found any stray balls I’d be trying figure out what their best shots were. Being that little bit closer to the players was magic (often there were no fans following the smaller groups, so it was okay to watch them play). If you need some tips for your game, what better way than being surrounded by professional golfers. Law of attraction anyone? 4. You Get Free Food! When applying to volunteer there was a passing mention of breakfast, a lunch, and a few snacks in the afternoon being provided. They downplayed this for sure. The breakfasts were insane. Olives, figs, salad, mushrooms, fried potato, and tomato were on my plate each morning. For others, the days with (real) bacon were the highlights. The prepacked lunches were great as well, as I swapped my salami sammies for fruit. And in the evening? Chips and free beer/wine. Winning. It’s not always going to be like that of course, but let’s pretend it is. As a vegan battling through Turkey, these are my best food days for sure. When a pro golf tournament is scheduled to be played at a course, the greenkeepers will often work for the 52 weeks leading up to the tournament to ensure the course is in the most pristine condition for the pros. These courses aren’t cheap to play at. If you can get a bonus round of golf on one of the following days, that’s awesome. Look into this before booking any flights, you’d hate to go home on Monday when you could on a near perfect course. At worst, most professional tournaments are in regions packed with golf courses nearby. Perhaps you never expected to be reading this article, yet love anything golf. One of the best parts of travel is the new experiences you have. This was definitely a new experience for me, and one that will be etched into my brain for quite some time. The comparisons to Beef were the best. Four full days out on a golf course is a long time. The TAO is a limited field event (78 players), I can’t imagine the hour’s volunteers put in at some tournaments. The volunteer organisers will love if you can work all four days (continuity), but if you can work two or three days, that’s usually more than enough. In pretty much all the tournaments I’ve looked up online, you get a tournament pass allowing you to be a spectator when you’re not volunteering. Perhaps you’re in a bit of a rut with your game. Your handicap has drifted out, and you don’t seem to have quite the same love for the game as a result. Well, there are countless inspirational quotes out there who say something along the lines of ‘surround yourself with greatness and your own game will life’. Use this as a chance to reinvigorate your love for the game. Whether you’re a solo traveller or not, meeting other people on holiday is awesome. Most of the time. Fortunately, you can skip the small talk as you should have something in common to chat about right away. Is this a selfish form of volunteering? This was a question I had in the back of my mind for much of the weekend. Ultimately, there are people who need you than millionaire golfers requiring people to prevent others from being silly as they hit a silly white ball. But if it’s not you, then someone else will apply. Sometimes you have to look after yourself. That brings us to the end of the article. Volunteers are needed for so many tournaments around the world. To start find tournaments to volunteer at, you can go to this site. Or Google the name of the tournament and the term volunteers/volunteering. Ready To Volunteer At A Golf Tournament? Let me know if you have any questions about volunteering below and/or share your previous/upcoming experiences. Ah, just saw this comment too. I would suggest, on the tournament days, I’d work the 7am – 11am shift if you aren’t staying far from the location (then you get the sweet lunch and can watch golf all avo). On the practice/pro-am days, I’d go with the 3pm till done option -> they seem more relaxed then. hopefully we’l see you again soon at the Turkish Airlines Open. Doesn’t look like I’ll be in the area this year, but will be shouting out if I am. Loved it last year.